Cover- Slick, simplistic and cool are the best words to describe this month’s cover. 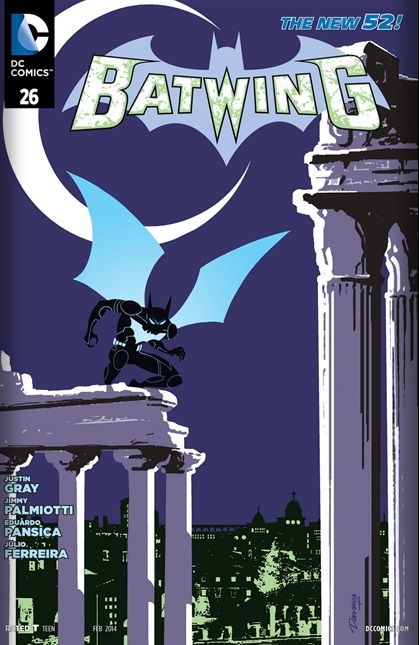 The color blue is a prominent feature as usual which purple, black and a few green hues help round out this very distinctive Batwing cover. Darwyn Cooke is on my radar! Art- Eduardo Pancisca does his usual bang up job on the interiors. The action scenes are pure gold! Action- Very Much on point although that has become the norm. Characterization-Luke continues to shine as he goes undercover this issue and nails it! Bat Bond- So Batwing….the new version is all about going to exotic locations around the world and taking down the villains that Batman hasn’t got the time to. Too easy- I don’t know about everyone else but I was very underwhelmed by Charlie Caligula after all the hype surrounding his take down was underwhelming on every conceivable level.